On Tuesday, February 28th, 2017, H.E. 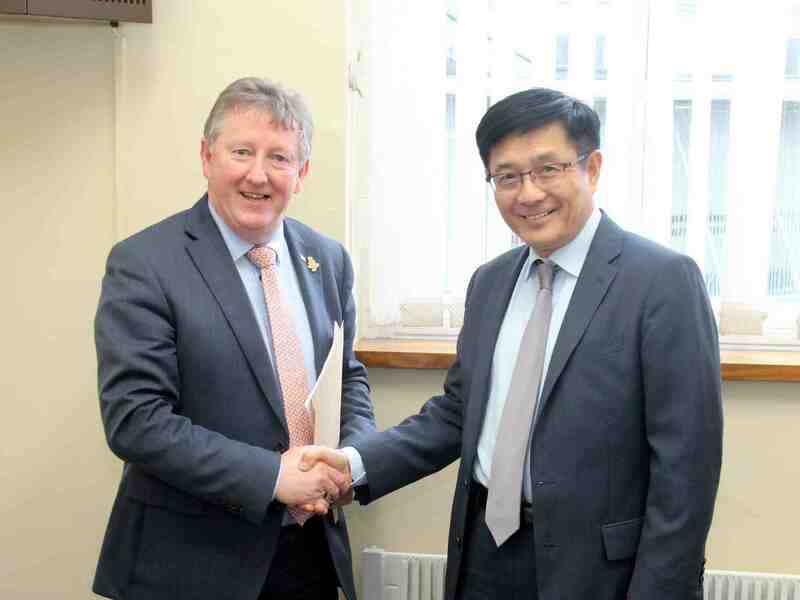 Dr. Yue Xiaoyong, Chinese Ambassador to Ireland, had a meeting in Leinster House with Mr. Sean Canney T.D., Irish Minister of State for the Office of Public Works and Flood Relief. They had a friendly exchange of views on China-Ireland relations and issues of shared interest. Ambassador Yue wished Minister Canney a pleasant and successful St. Patrick’s Day trip to China. Both the Ambassador and the Minister expressed hope and confidence that China-Ireland cooperation would enjoy steady further growth in the years to come. Also present at the meeting were Mr. Pan Xiongwen, Head of Political and Press Section of the Chinese Embassy and Mr. Brian Higgins, private secretary to the Minister of State.